What Day Of The Week Was January 15, 1974? 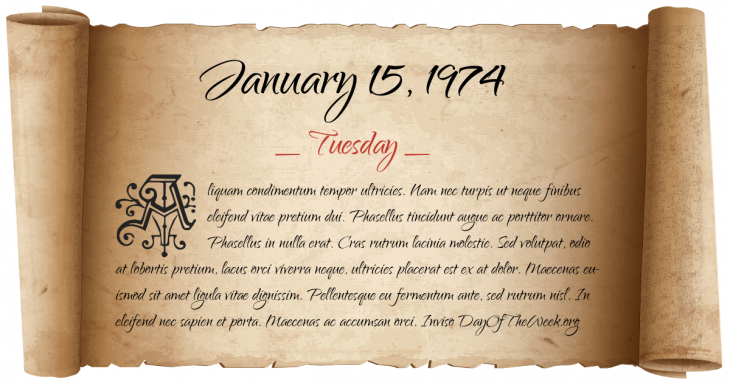 January 15, 1974 was the 15th day of the year 1974 in the Gregorian calendar. There were 350 days remaining until the end of the year. The day of the week was Tuesday. A person born on this day will be 45 years old today. If that same person saved a Nickel every day starting at age 6, then by now that person has accumulated $717.10 today. Dennis Rader aka the BTK Killer kills his first victims by binding, torturing and murdering Joseph, Joseph II, Josephine and Julie Otero in their house. Who were born on January 15, 1974?